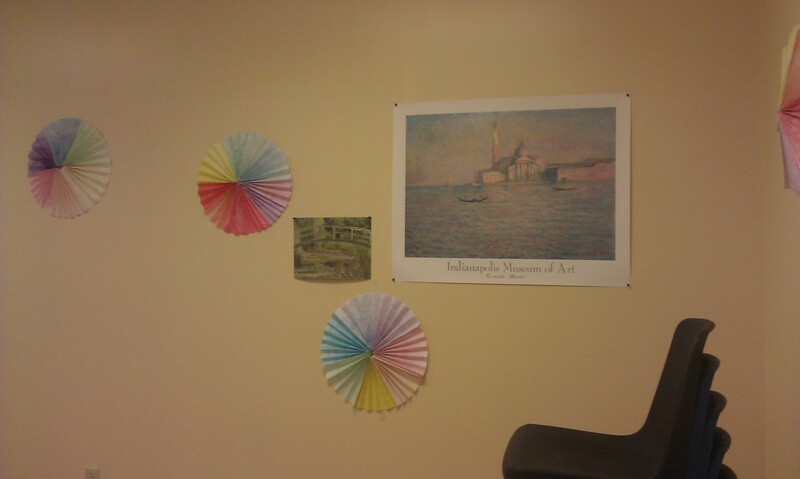 Color Wheel Installation – Emma Teaches Art! I was recently explaining to someone that asking and encouraging my students to take ownership of their school space was very important to me. I strongly believe that if a students feels that they are a part of the whole school community they are much more likely to succeed. This seems like an obvious observation, but how does a teacher encourage students to feel a part of a whole, especially when I have new students coming in every 2 weeks? My solution has been many things, including my after school programs. however, during class, it’s all about decorating the space with their own art work. I love the boost of self confidence kids get from seeing their artwork hung up. 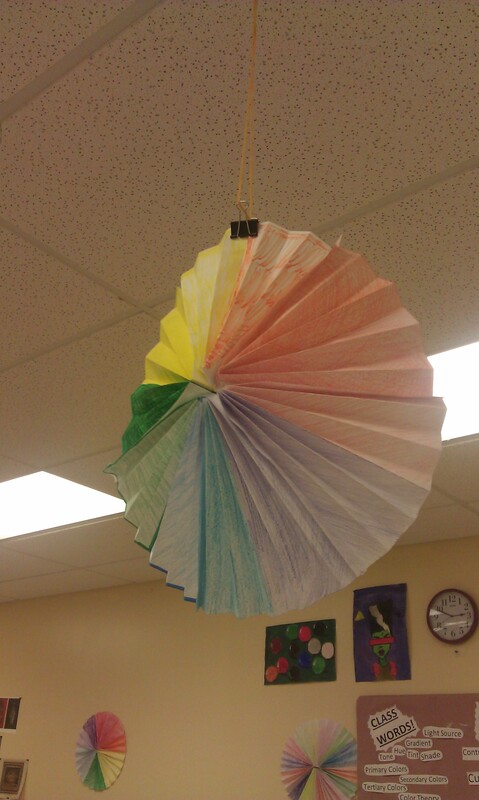 So for this project, before I even began an entire unit on the color wheel, my students worked together in groups to create fun, fan-like color wheels, that they then hung around the classroom. 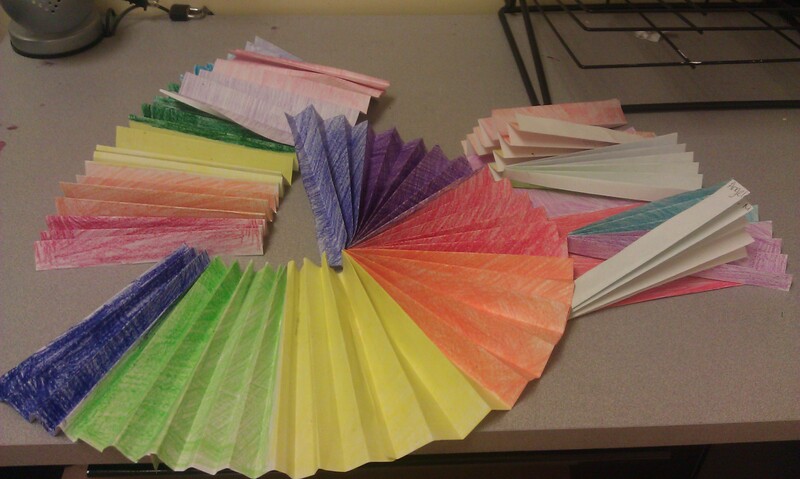 Update: 5/23/13 So this is how our Color Wheel Fans were made. There were six students to a group and each of them had to pick two colors that were next to each other on the color wheel. For example, red and orange, or orange and yellow, or yellow and green …etc. Then they folded each paper accordion style and used glue sticks to attach them in order. Then they attached the two ends together and ended up with a circular fan. Nothing better than decorating your art space with artists’ own works! I love this idea. What were the steps they took to section off parts of the fan? Did they just divide up the circle by how many people there were in a group? @Roylcoblog There were six students to a group and each of them had to pick two colors that were next to each other on the color wheel. For example, red and orange, or orange and yellow, or yellow and green …etc. Then they folded each paper accordion style and used glue sticks to attach them in order. Then they attached the two ends together and ended up with a circular fan. I hope this answers your question! This is really great. I’ve been following your blog since its inception and I’ve been primarily interested in the ways in which you get your students interested in creating art. I’d previously used the phrase “vintage Emma” to describe projects that you’d created which engaged the students’ creativity while making them feel a part of a larger whole. Well, this project is “vintage Emma par excellence”. The level of engagement with the students is admirable; the students’ creativity is stunning; and the artistic results are beautiful. I’d ask you to keep up the good work, but it’s really not my place to say so.